A white- or pink-gold gown, a face lit up with diamonds, a heart whose regular beats heightens its precision... 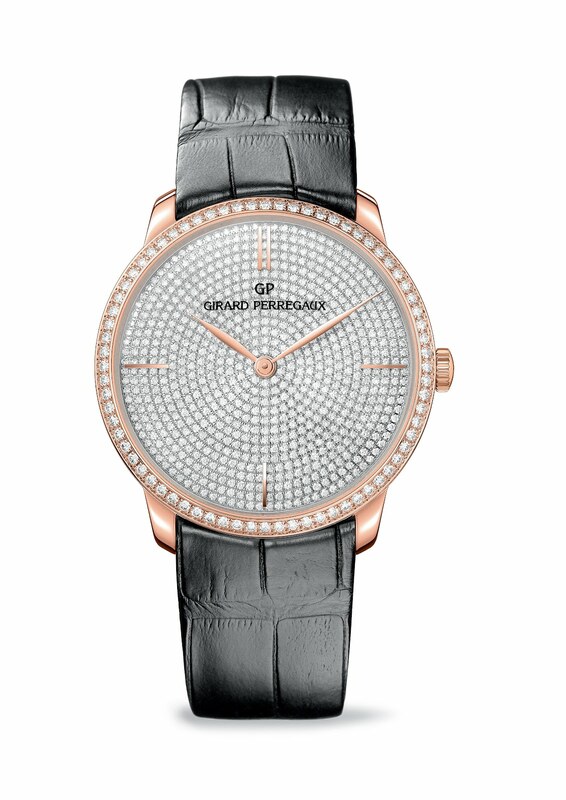 The Girard-Perregaux 1966 Jewellery watch bears witness to the virtuosity of the brand. Craftsmanship where elegance competes with technology. The legendary 1966 collection pays homage to a prolific era in terms of creativity, technical expertise and performance. It was a period that hailed Girard-Perregaux watches, honouring them with numerous awards. Since 2006 the 1966 line has proposed manufacture movements with automatic winding in ultra-thin cases produced entirely in the Girard-Perregaux workshops. Today the watch case of the Girard-Perregaux 1966 Jewellery watch bears witness to this. Cut from white or pink gold, this 38 mm diameter remains faithful to the great classics of watchmaking. Its elegance is revealed both in the sparkle of the 807 diamonds that carpet the watch and in the harmony emitted by its silhouette. Haloed with a gem-set bezel, the slightly curved dial, entirely paved with "brilliant"-cut precious stones, required hours of meticulous gem-setting work. The twinkling diamonds are arranged in concentric fashion striking hypnotic effect. Keeping watch over time, the "leaf"-type hour and minute hands and four applied hour markers lend their elegance to the sophistication of the piece. The alligator-skin strap supplely encircles the wrist, closing with a delicately gem-set ardillon buckle. The purity of the piece is completed by the beauty of its mechanism. The mechanical movement with automatic winding manufactured at Girard-Perregaux is equipped with a power reserve of over 46 hours. Visible through the sapphire-crystal case back, its gold oscillating weight is engraved with circular Côtes de Genève decoration. Renowned for its delicacy and reliability, the calibre 3300 is the worthy heir to 221 years of watchmaking expertise.